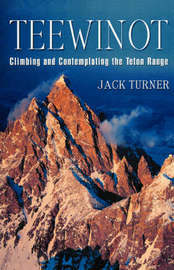 This is a book about a mountain range, its climbs, its weather and the glory of the wild. It is also about a small group of climbers, nomads, who inhabit the Teton Range each summer, who know it as intimately as it will ever be known. TEEWINOT is a remarkable account of what it is like to live and work in these spectacular mountains. It has something for everyone - spellbinding accounts of dangerous and deadly climbs, unbridled awe at the beauty of nature and an extreme passion for the environmental issues facing America today. Jack Turner was educated at the University of Colorado and Cornell University and taught philosophy at the University of Illinois. Since 1975, he has traveled in India, Pakistan, Nepal, China, Tibet, Bhutan, and Peru, leading more that forty treks and expeditions. He has lived in Grand Teton National Park for the past twenty-two years and teaches mountaineering during the summers at Exum Mountain Guides. He is the author of a collection of essays, The Abstract Wild, and a forthcoming account of travels in the Greater Yellowstone ecosystem.